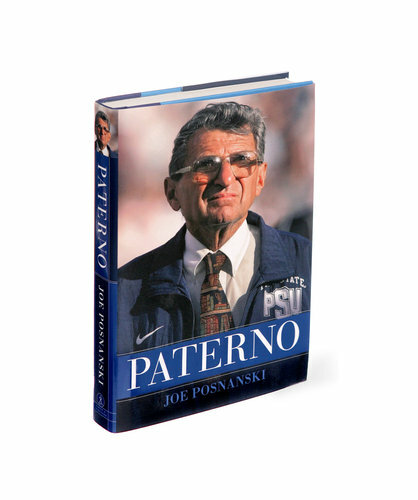 Joe Posnanski’s much anticipated, yet ill-timed, biography of former Penn State head football coach Joe Paterno, simply entitled “Paterno,” will be released tomorrow, with advance copies already having been distributed to the media. Today, the New York Times published its review, written by Dwight Garner. My review of the review is that Garner does a pretty straight job, but he injects some opinions that are still based on conjecture (which included accepting the Freeh report’s conjectures as fact). He feels that Paterno’s undergraduate experiences at Brown are given short shrift, and in this respect I admit that I always like looking back on the early days of figures who have become larger than life many years later. The book’s best chapter, and the one many people will turn to first, is titled simply “Sandusky.” Paterno hired Mr. Sandusky as a full-time assistant coach in 1969, when Mr. Sandusky was 25, and made him Penn State’s defensive coordinator eight years later. The two men disliked each other almost from the start, Mr. Posnanski reports, and he adds new detail about this uneasy relationship. Paterno thought Mr. Sandusky was a glory hound who wanted his job. Their styles were different. Paterno liked a drink now and then. Mr. Sandusky was a teetotaler. I’ve got a Kindle copy of the book coming to me just as soon as Amazon releases it. My own review will be forthcoming. This morning, I was dismayed, but amused, by some of the Sunday morning TV news talking heads’ takes on whether Penn State football merits the “death penalty” being levied at the behest of the NCAA. Speaking from the London Olympics site on Meet the Press, Bob Costas of NBC Sports was strongly in favor of Penn State giving up its football program either voluntarily or at the behest of the NCAA. Thanks, Bob. We appreciate the support. George Stephanopolous asked his panelists on ABC’s This Week whether they thought that the NAACP [sic] should come in and shut down Penn State’s football program with the “death penalty.” Only after the panelists had all taken their turns did Wee George correct his initial faux pas. First around the panel was milk chocolate toned Democratic adviser Donna Brazile, the only non-pasty skinned panelist this week. She was too kind to correct Stephanopolous about the mouthpo (which is a typo of the mouth), but she entered a sea of controversy by likening the situation at Penn State to that of the Catholic church in the wake of its long-term child molesting issues. As such, she believed that a suspension in order. Conservative baseball überfanatic George Will believes strongly that not only should Penn State shut down its football program — for good — but so should every other institution of higher learning that has a big-time football program. He believes that academics and football are at best strange bedfellows, and the combination easily lends itself to corruption. ABC political analyst Matthew Dowd, a Catholic, made an analogy that will send him to the confessional. Like Donna Brazile, he went papal on the PSU situation. Dowd added something that hit at what this Turkey has been harping on all along: if you think that Penn State is alone in shielding the public and the legal authorities from its transgressions, think again. Just about all major universities have skeletons in their closets. Meanwhile, Democratic strategist, cue-ball headed LSU junkie James Carville, said that it would be a “really dumb idea” to suspend Penn State football, as it would penalize people not even remotely responsible for Penn State’s recent scandal. In this Turkey’s opinion, Carville is right. This is one of the rare occasions on which I’ve agreed with James, so please note it well. Carville’s wife, Republican strategist Mary Matalin, said that she’s not a football fan, but understands that there’s quite a football culture in Baton Rouge. So her opinion doesn’t count. Everybody’s got an opinion. We’ll take this beyond the Sunday morning TV stage to look around at some of the other media stories addressing the dreaded death penalty for Penn State. Some players’ reactions to the death penalty rumors were reported by Audrey Snyder for USA Today. Mike Greger of Metro Philly believes that Penn State won’t get the death penalty. According to Michael Sedor of PennLive.com, the Nashville Tennessean, the Birmingham Alabaman, and the Orlando Sentinel all want the death penalty for Penn State. He gives links to their articles. All southern papers, all in SEC country. Whoda thunk it? The Patriot News, as usual, is full of the best material on the subject. You can access a page of links to a Sunday morning’s worth of interesting and intriguing stories here. On a more positive note, Adam Rittenberg of ESPN writes about the community starting the healing process. Unfortunately, vaunted SI sports writer Rick Reilly feels differently about the whole thing, which he strongly condemns in his piece for ESPN. Also for ESPN, Howard Bryant writes that Penn State should drop football. More ESPN: The unpronounceable Gene Wojciechowski writes that Paterno empowered a predator. This includes a video of Mark May’s perception of Joe Paterno and Penn State. Casey McDermott of the Daily Collegian addresses Penn State’s failure to comply with the Clery Act. That should give you plenty to chew on for a peaceful Sunday evening. As always, comments are welcome.